French education abroad is based on a multilingual and multicultural education. From kindergarten to high school, students learn and interact with multiple languages ​​and cultures. Students, according to their options, have the opportunity to choose a linguistic path that is adapted to his personal project. The school offers a great opportunity to develop and enhance the knowledge of these languages ​​and cultures. The languages offered by the French educational institutions abroad has become a major factor in their attractiveness and development. It is adapted to the mobility of students and families through quality education that takes into account the evolution of our society. The French school network abroad plays a key role in the policy of linguistic and cultural influence of our country as well as in the diffusion of its educational expertise. This cooperation strategy is based on solidarity and reciprocity values, sharing and developing the linguistic and cultural diversity around the world. Language teaching is, within the AEFE (Agency for French Education Abroad) network, one of the favoured media of our specific educational excellence and so, it must convey our capacity for innovation and experimentation. It is thus crucial that the network be creative and relevant in its implementation of language teaching and intercultural education. These two aspects must necessarily remain inseparable, pursuant to the scientific progress in this area as well as the educational policy aims defined by the European and international conferences and agreements, with which the AEFE’s strategic orientation is in line. Language teaching is one of the main approaches of all the schools belonging to the AEFE network. Lycée Français de Kuala Lumpur Henri Fauconnier benefits from an hourly exemption enabling it to implement advanced English classes. In primary school, LFKL is equipped with innovative and very efficient measures for teaching English which leads to an early and solid language learning, quickly paving for our students the way to multilingualism. Said measures also enable them to study in Anglo-Saxon universities later. Pursuant to the AEFE’s educational departments’ circular, LFKL has implemented since the beginning of the school year 2013 reinforced measures for language teaching, particularly English teaching in primary school and including language as well as language integrated classes (CLIL: Content and Language Integrated Learning. A class given in a foreign language: for example, science in English). The teaching of the English language is divided to reach a weekly amount of 4 to 8 hours, from preschool to CM2, depending on each pupil’s language profile and mastery of the French language as the latter remains the main language at school. In the first half of the program, the pupils work in small groups (of up to 12-13 pupils) according to the Common European Framework for Languages. In the second half, they are placed in more important situations through the teaching of other subjects in English (CLIL). Foreign languages are taught as early as preschool through educational activities focusing first on speaking then, gradually, on writing during the 2nd cycle. Language teaching is done in small groups (of up to 13 pupils) from the last year of preschool onwards. These language groups are heterogeneous, which allows everyone to progress more rapidly and focus particularly on beginners while endeavouring to help pupils whose mastery of English is already good to reach a high level. At the end of the school year, all CM2 pupils sit for internationally recognised English language certificates awarded by Cambridge Exams. Each pupil thus obtains a certificate, from A1 to B1, upon finishing primary school. Every year our students have the opportunity to take the DELF (Diplôme d’Etudes en Langue Française) exam. The DELF certification is a French foreign language diploma issued by the French Ministry of Education. It is valid for life and is recognized worldwide. This diploma validated by the school, provides a proof of proficiency for education purpose, to enter French Universities (DELF B2 and above) or for work purposes. It allows students to study, work and immigrate in French-speaking countries. In 2017, our middle school and secondary school students from 4ème and 2nde all successfully passed the DELF exam. At the LFKL, an early English program is offered to children in kindergarten through educational activities in different group levels. In secondary school, English classes are divided into two levels: ESL (English as a Second Language) and ELA (English Language Arts) according to each student’s language proficiency. English teachers follow the Cambridge program, allowing students (from CM2, 3ème and 1ère) to take language exams every year and receive international language certifications such as the Cambridge exam and the IELTS. Last year 73 middle school students (5èmes, 4èmes, and 3èmes) and high school students (2nde) all passed their Cambridge exam scoring high percentages in their KET (Key English Test), PET (Preliminary English Test) and FCE (First Certification in English). 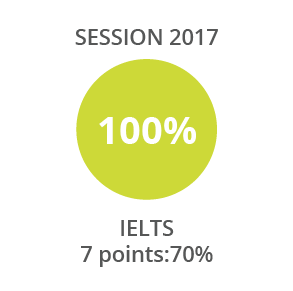 In 2017, our final year students all managed to pass successfully their IELTS exam. The IELTS (International English Language Testing System) is designed to assess the language ability of people who want to study or work where English is the language of communication. It is recognised and accepted by over 10,000 organisations worldwide, including universities, employers, professional bodies, immigration authorities and other government agencies. Each section of the IELTS (reading, listening, speaking, and writing) has a score that varies from 0 to 9 points, every grade corresponds to a specific level. At the end of their final year, students are expected to score 5 points on the scale from 0 to 9. All of our students have acquired a minimum of 5 points, which is equal to the B2 level of the Common European Framework Reference. 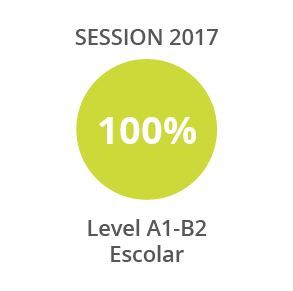 More than 70% of our students reached the levels C1 and C2 (scoring 7 points at the IELTS). Some attained 9 points in different section of the test (reading, listening). The Diploma of Spanish as a Foreign Language (DELE) is an official title that certifies the Spanish language degree of linguistic competence, granted by the Ministry of Education, Culture and Sport of Spain. Last year, 20 of our secondary students (from 1ère to Terminale) all passed their DELE certification A2-B1 exam successfully. Last school year 55 students passed their Chinese language exams, the HSK (level 1,2,3 and 5) and YST (Level 1, 2 and 3). The Chinese Proficiency Test (HSK) is an international standardized test that evaluates non-native Chinese speakers’ abilities to use Chinese language in their daily, academic and professional lives. HSK consists of six levels, namely HSK (level I), HSK (level II), HSK (level III), HSK (level IV), HSK (level V), and HSK (level VI). The Youth Chinese Test (YCT) is an international standardized test of Chinese language proficiency for primary and middle school students. It evaluates their use of Chinese as second a language in their daily and academic lives. YCT is divided into writing and speaking tests, which are independent to each other. The writing test consists of four levels, namely, YCT (level I), YCT (level II), YCT (level III), and YCT (level IV). The speaking test consists of two levels, YCT Speaking (Primary Level) and YCT Speaking (Intermediate Level).